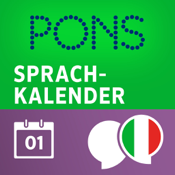 Get your daily dose of Italian with this language calendar from PONS. You assimilate a foreign language particularly well if you are in contact with it regularly. That’s why we have split your personal language training schedule into morsels. Every day you will receive new and motivating short exercises from varying domains. Source language is always German. We invite you to try the calendar out for a free one-week trial. If the trial convinces you, you can subscribe to the app for 6 months (for 4.99 €). The subscription is extended automatically and can be cancelled at any time. + New exercises on a daily basis: a new foreign-language titbit is activated each day – learn Italian bit by bit. + Wide variety of categories: e.g. vocab exercises, articles about Italy or fun grammar tasks. + Different types of exercise: language-learning never gets boring with seven different games types. + Handy reminder function: every day you receive a reminder of your Italian lesson. PONS, the language-learning brand in green livery, has over 30 years’ experience in developing language-learning materials and dictionaries for all walks of life: tried and trusted dictionaries and grammars, audio language courses, language-learning software and free online learning activities.